Avenbury Lakes is a 55+ community in Avon, Ohio. This established active adult neighborhood is situated on 145 acres of lush landscaping that consists of fishing lakes, wetlands, woodlands, and natural open spaces. Residents enjoy the rural charm, scenic nature views, and serene setting that make Avenbury Lakes a welcoming and relaxing environment. Homeowners also have access to great resort-style amenities at the Avenbury Lodge where they can be as active and social as they want. With just 352 homes, residents can easily mingle with neighbors to build lifelong friendships. The central hub of physical activity and social recreation is the Avenbury Lodge. This well-appointed clubhouse features plenty of indoor and outdoor amenities for all residents to enjoy. Homeowners gather in the grand ballroom for parties and events. Neighbors mingle in the multi-purpose room while making arts and crafts projects. Staying in shape is easy with the well-equipped exercise room and indoor pool. Residents have fun game nights in the cards or billiards room. They can also watch a movie or favorite show in the mini theater or spend some quiet time in the library. A catering kitchen, meeting room, and business center are also available for homeowners to use at their disposal. Outdoors, residents can swim in the pool on a hot summer day or soak in the adjacent spa. Multiple sports courts for tennis, bocce ball, and pickleball are available for friendly competition. Golfers can practice their short game on the putting green. A picnic area is the perfect spot to enjoy lunch al fresco with a neighbor. The community garden is great for resident green thumbs. Spending time outdoors is easy because the neighborhood is surrounded by beautiful parks and natural space as well as a gazebo, dock, and three lakes for catch-and-release fishing. Homeowners can stroll along the community's walking and biking trails to remain active any day of the week. R.V. parking is also available, making it convenient for residents to store their vehicles when not in use. Avenbury Lakes was developed by Scaletta Development Corporation between 1999 and 2006. This age-restricted community consists of 352 attached and single-family homes that come in a variety of styles and price points. Attached homes range in size from approximately 1,444 to 1,753 square feet. They have two bedrooms, two bathrooms, and an attached two-car garage. These residences typically feature split floor plans, great rooms adjacent to dining rooms, eat-in kitchens, sunrooms, private patios, large master suites with walk-in closets, and plenty of storage space. Homebuyers who want more space and privacy can choose from a variety of single-family home designs. These detached homes offer approximately 1,467 to 1,973 square feet of living space and have two or three bedrooms, two or two-and-a-half bathrooms, and an attached two-car garage. These homes feature spacious great rooms, large kitchens, sunrooms, private backyards, laundry rooms, formal dining room, and basements with extra storage space. Avenbury Lakes is a vibrant and welcoming 55+ community that provides plenty of social activities, events, and clubs that keep residents entertained. They can join a variety of interest groups like travel club, quilt club, garden club, lodge volunteers, poets society, prayer chain, cooking club, book discussion group, and breakfast forum. Active adults can meet their fitness goals by participating in water aerobics, water volleyball, stretch and tone, or the walking group. Neighbors can also get together for fun game nights to play poker, pinochle, Mah Jongg, canasta, or bridge. Whatever residents choose to do, they won't have a problem keeping their social calendars full throughout the year. Avenbury Lakes is conveniently located within Lorain County in Ohio. Homeowners have easy access to Interstate 90 and Highway 254 for getting around town quickly. Avon Commons Shopping Center is just two minutes away and offers plenty of shopping and dining options like Kohl's, Target, The Home Depot, Costco, World Market, Old Navy, IHOP, Applebee's, a gas station, grocery store, bank, and CVS Pharmacy. Residents can spend time at Miller Nature Preserve as well as the beautiful shores of Lake Erie for outdoor recreation. 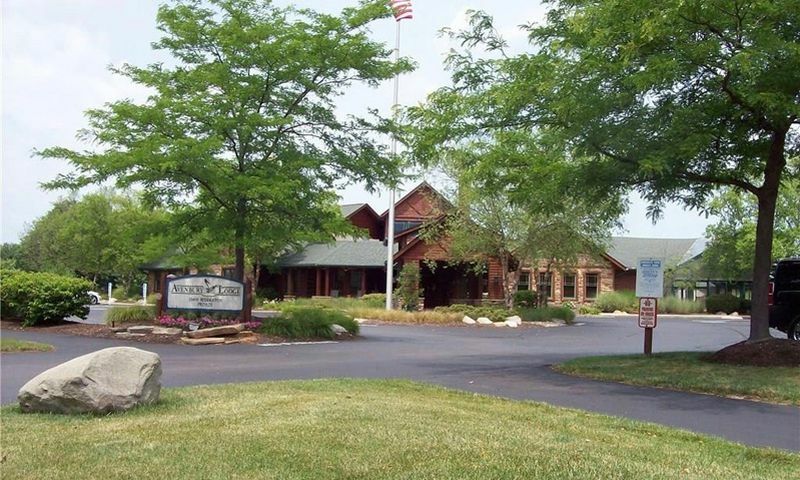 There are several golf courses in the area including Avon Oaks Country Club, Lakewood Country Club, Hilliard Lakes Golf Club, and Meadowood Golf Course. Homeowners can drive to Cleveland which is less than 30 minutes away for additional entertainment and attractions. When traveling long distance is necessary, Cleveland-Hopkins International Airport is nearby. Avenbury Lakes provides a great location as well as resort-style amenities and low-maintenance homes that make it the ideal retirement destination for active adults in Northeast Ohio. There are plenty of activities available in Avenbury Lakes. Here is a sample of some of the clubs, activities and classes offered here. Attached homes range in size from approximately 1,444 to 1,753 square feet. They have two bedrooms, two bathrooms, and an attached two-car garage. These residences typically feature split floor plans, great rooms attached with dining rooms, eat-in kitchens, sun rooms, private patios, large master suites with walk-in closets, and plenty of storage space. Please Note: Floor plans are not available at this time. Homebuyers who want more space and privacy can choose from a variety of single-family home designs. These detached homes offer approximately 1,467 to 1,973 square feet of living space and have two or three bedrooms, two or two-and-a-half bathrooms, and an attached two-car garage. These homes feature spacious great rooms, large kitchens, sunrooms, private backyards, laundry rooms, formal dining room, and basements with extra storage space. Please Note: Floor plans are not available at this time. 55places.com is not affiliated with the developer(s) or homeowners association of Avenbury Lakes. The information you submit is distributed to a 55places.com Partner Agent, who is a licensed real estate agent. The information regarding Avenbury Lakes has not been verified or approved by the developer or homeowners association. Please verify all information prior to purchasing. 55places.com is not responsible for any errors regarding the information displayed on this website.